LISBON — The snowstorm anticipated all week started early Saturday afternoon with some light snow which turned into rain by evening, leaving many to believe the area had avoided the worst of it, but the storm struck with a vengeance overnight, and county residents awoke Sunday morning to several inches of the white stuff complicated by a layer of ice left behind from the earlier rain. For the most part, residents seemed to have prepared early for the worst by getting their shopping out of the way on Friday, and many store parking lots throughout the county had few cars in them by Saturday afternoon, and roadways were also relatively clear as the wintry weather began. In areas where parking bans had been implemented, such as East Liverpool, streets were nearly void of vehicles Saturday as street crews prepared for battling the 8-12 inches of predicted snow. Some businesses, such as area Sparkle Markets, closed early on Saturday, so their customers and employees did not have to risk being on dangerous roads. While residents slept overnight, however, road crews were out trying to make headway with the snow that began falling heavily about 2 a.m., also dealing with heavy winds that blew through the area. He said crews also encountered a tree down about 8 p.m.
“The crews came back out at 2 a.m. That crew dismissed at 8 a.m., the second crew is out while that crew sleeps. But, we will work continuously to keep the roads as clear as possible,” Allen said. He said that, with the wind chill, he was encouraging people to stay home and not go out unless absolutely necessary. 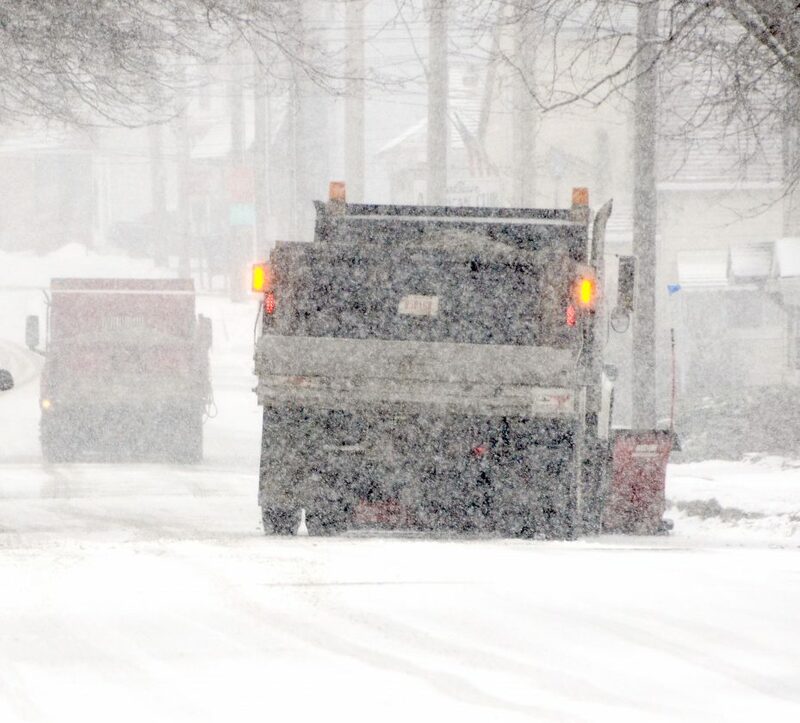 Police dispatchers in East Liverpool were not reporting any major snow-related accidents, saying, “I think people took heed” of messages to stay off the roads. Churches were canceling their Sunday services as early as Saturday night due to the worsening weather. A dispatcher at the sheriff’s department said there had been no storm-related issues that he knew of. Wellsville Administrator Jarrod Grimm had asked that cars be parked off Main Street until the snowfall ended on Sunday and village police have announced that Village Hall will be used as a warming center in the event the snowstorm causes a long-term power outage, encouraging those who are elderly or disabled and need assistance to call 330-532-1522. Grimm also encouraged residents in a social media post to stay off the road, saying street crews had been working since 2 a.m., but with such a large volume of snow in a short period, it had been difficult to keep up. “The street department will be working diligently to get the roads to a state that they can be safely passable,” Grimm said, thanking residents for their cooperation. In East Palestine, firefighters responded Sunday afternoon for a building that had siding falling from it due to the wind, according to a dispatcher. Sunny skies but temperatures in the teens prevailed as the snow ended Sunday morning. But the cold temperatures and continuing poor road conditions had concerns on the minds of officials at North Star Critical Care ambulance company in Glenmoor, who urged through their social media page that people check on their neighbors, friends and family. This would be especially important for those who are elderly, infirm or disabled.